Ward&apos;s House Winding Hole No 2 is a minor waterways place minor waterways place place on the waterways major waterways place village town city on the Lancaster Canal (Main Line) between Ribble Link - Lancaster Canal Junction (2 miles and 4¼ furlongs to the east) and Lodge Hill Junction (Junction with Lancaster Canal - Glasson Dock Branch) (20 miles and ½ furlongs to the north). 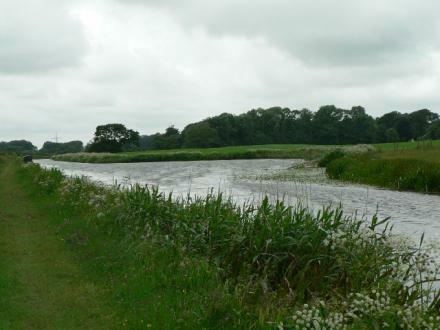 The nearest place in the direction of Ribble Link - Lancaster Canal Junction is Ward&apos;s House Winding Hole No 1; 2¼ furlongs away. The nearest place in the direction of Lodge Hill Junction is Salwick Hall Winding Hole; 2 furlongs away. Look in the opposite direction and you will see BNFL's processing plant! Preston — 1274 yards to the southwest. Darkinson Lane, Preston, PR4 0SJ — 1380 yards to the southeast. Treales Road, Kirkham, PR4 0SA — 1333 yards to the northwest. Lea Lane, Lea Town, Lea Town, PR4 0 — 1182 yards to the southeast. Treales Road, Salwick, Kirkham, PR4 0SA — 1334 yards to the northwest. Bryars Farm, Lea Lane Unit 4, Preston, PR4 0RN — 1192 yards to the southeast. Preston — 1531 yards to the southeast. Woodfield, Preston, PR4ORN — 1122 yards to the southeast. Gracemire Farm, Preston, PR4 0SA — 1203 yards to the northwest. Salwick Bridge Farm, Treales Rd, Salwick, Lancashire, PR4 0SA — 1126 yards to the northwest. Preston — 1102 yards to the southeast. The Reverend John Bannister. Lund vicarage, church lane, Clifton,, Preston, PR40ZE — 1622 yards to the southwest. Station Road, Preston — 1228 yards to the west. Preston — 1091 yards to the east. Preston, PR4 0YH — 1266 yards to the southwest. Preston, PR4 0 — 692 yards to the west. Bryars Farm, Lea Lane, Lea, Preston, PR4 0RN — 1227 yards to the east. Salwick, Clifton,, Preston, PR4 0YE — 1265 yards to the southwest. 100 Industrial Way, Preston, PR4 0 — 1090 yards to the southwest. 1 Lea Lane, Preston, PR4 0RN — 923 yards to the east. Darkinson Lane, Preston, PR4 0RJ — 1317 yards to the southeast. Wards House Farm, Lea Lane, Lea Town, Preston, PR4 0RN — 849 yards to the east. Preston — 1430 yards to the northwest.